Would you like to get back into shape? We offer fitness, dance and aquafun classes in the pool. The most adventuresome will enjoy "Le Royaume des Arbres", the nearby adventure park located 500 m from the camping, for fun with family or friends. Take time to discover the Luberon, an unspoiled region that is perfect for hiking, biking or horseriding. The Durance river is a great place for fishermen and canoe buffs to enjoy. 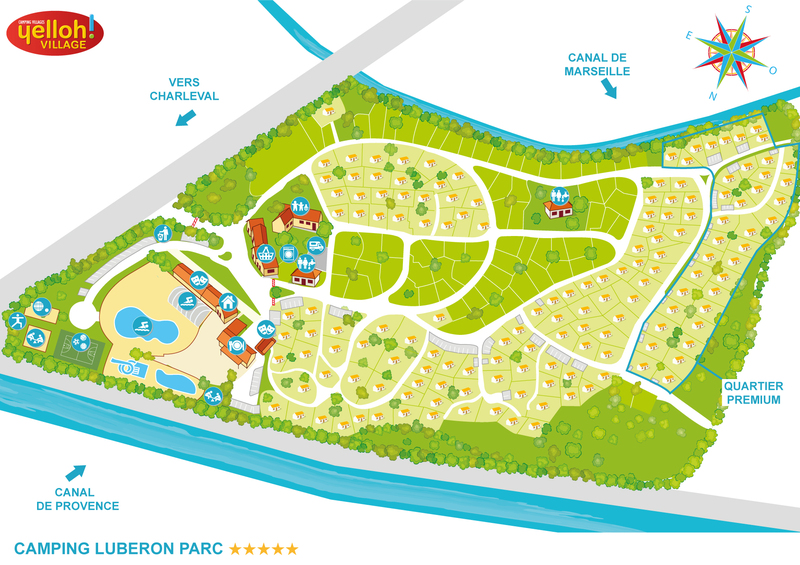 Take advantage of your stay at the Luberon Parc campsite to get away in nature! The camping is ideally located in Charleval, only 60 km from Marseille and Avignon and about thirty kilometres from Aix-en-Provence. You can visit these dynamic cities during your stay. Walk through Marseille's diverse neighbourhoods and experience the multi-ethnic influences that give the city a special charm. Visit Salon-de-Provence and enjoy the Provencal way of life during a visit to the soap manufactures, the Nostradamus museum, the colourful little streets… Finally, make sure to visit Aix-en-Provence on Sunday morning for the market with its typically southern scents… Stop off at Grimmland Parc, where a giant maize maze and all sorts of other activities await your children! Your holiday at the Yelloh! Village Le Luberon Parc will have the sweet fragrance of Provence, between the unspoiled nature in the Luberon and the nearby attractive cities.